Elvis greatly admired Jimmy Jones, bass singer with the Harmonizing Four (Elvis had a fascination with bass singers and would occasionally try a bass part himself). He wanted Jones to take part in the How Great Thou Art sessions, but the singer could not be located. Nevertheless, Elvis went ahead and recorded Jones's "So High." The number might be attributed in this form to Jones, but it is clearly strongly influenced by the gospel "You Must Come In At The Door," recorded in 1923 by the Wiseman Sextette. The Rev. Gary Davis's "Twelve Gates To The City," which he first recorded in 1935, is also a clear influence. 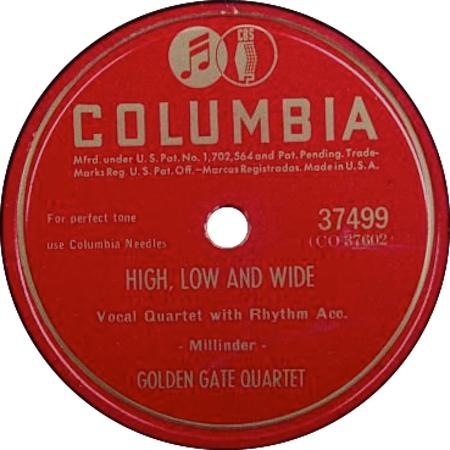 The Golden Gate Quartet recorded their version of the "So High" in April 1947, using the title "High, Low And Wide." The number was released on single, Columbia 37499. The group began singing together in the mid-1930s as the Golden Gate Jubilee Quartet. Initially a gospel group, they moved into jazz and swing styles during the 1940s whilst continuing their gospel singing. At the end of the 1950s they moved to France, where they remain popular. But the song's trail leads still further back, with much of its structure and lyrics found in Rev. Gary Davis's 1935 recording of "Twelve Gates To The City," with credits going to Bowles, Hoyle and Frye.